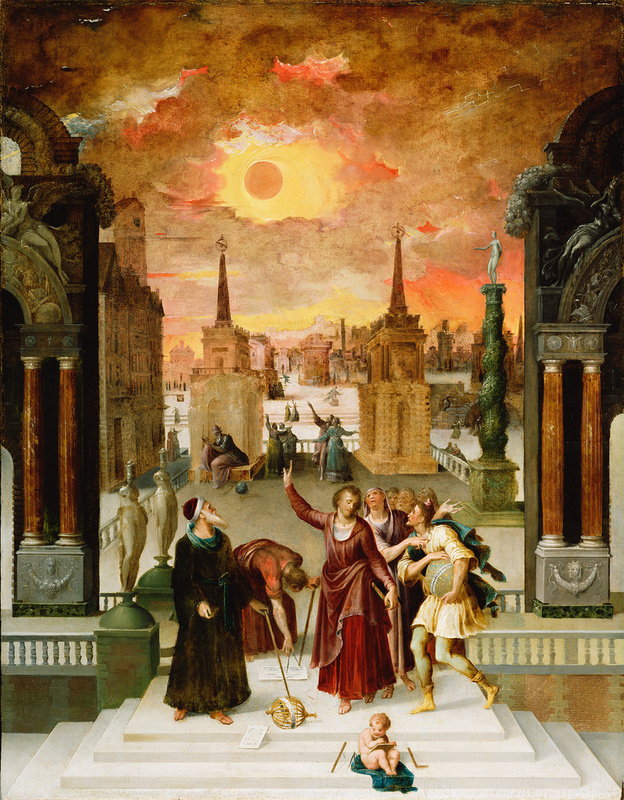 In 1571 a dramatic solar eclipse occurred: this event probably served as the subject of this painting by Antoine Caron. He painted it at the court of Catherine de Medici, queen of France, who, like many rulers of the time, was extremely superstitious and fascinated by astronomical phenomena, often seeing eclipses and natural disasters as foreboding omens. In the painting, astronomers gather in a town square beneath the shadowed sun. A bearded Greek philosopher in the foreground looks at the sky and points to an armillary sphere on the ground. Next to him, the central figure, Dionysius the Areopagite, holds a book, points to the sky, and looks at the celestial globe carried by the figure running up the steps at the right. Dionysius preaches the Christian message of salvation to pagan Greek philosophers. A putto, seated on the steps between a square and straight edge, writes on a tablet, recording the event. In the background on the right, a statue representing Urania, the muse of Astronomy, stands on a twisted column. Near the statue, figures run and point towards the heavens while seeking cover. Above, an ominous red sun glows and lightning streaks the stormy, cloud-filled sky. Sir Anthony Frederick Blunt, British, 1907 - 1983 (London, England), by gift to John Gaskin, 1962. John Gaskin (London, England), sold through Adrian Ward-Jackson Ltd. (London, England) to the J. Paul Getty Museum, 1985. Christie, Manson, & Woods, London. Catalogue of Old Pictures: The Property of the Late Mrs. Braund. January 17, 1947, p. 10, lot 121. A Loan Exhibition of French Painting of the XVIIth Century in Aid of the Merchant Navy Comforts Service, exh. cat. (London: Wildenstein and Co., 1947), p. 10, no. 8. Ehrmann, Jean. "Antoine Caron. Tableaux du 'Carrousel à l'éléphant' et des 'Astronomes étudiant une éclipse.'" Bulletin de la Société de l'histoire de l'art français, 1949 (1950), p. 27. Catalogue of an Exhibition of Landscape in French Art, 1550-1900, exh. cat. (London: Royal Academy of Arts, 1949), p. 3, no. 9. Ehrmann, Jean. "Antoine Caron." Burlington Magazine 92, no. 563 (February 1950), pp. 34-36, fig. 1. Rosenblum, Robert. "The Paintings of Antoine Caron." Marsyas 6 (1950-53), pp. 4-5, pl. II: 2. Adhémar, Jean. "Antoine Caron et son influence." Médecine de France 20 (1951), p. 35. Bologna, Ferdinando, et al., eds. Fontainebleau e la maniera italiana, exh. cat. (Naples: Sansoni, 1952), p. 31, no. 52, pl. 50. Blunt, Anthony. Art and Architecture in France 1500 to 1700 (Harmondsworth: Pelican, 1953), p. 89. Adhémar, Jean. Le Dessin français au XVIe siècle (Lausanne: Editions Mermod, 1954), p. 114. Ehrmann, Jean. "Antoine Caron et les fêtes de la cour des Valois." Plaisir de France 21 (August 1954), p. 11. Ehrmann, Jean. Antoine Caron: Peintre à la cour des Valois 1521-1599 (Geneva and Lille: Librairie Droz and Librairie Giard, 1955), pp. 22-24, 44, pl. VIII. Europa, Raad van, ed. De Triomf van het Maniërisme: de Europese stijl van Michelangelo tot El Greco, exh. cat. (Amsterdam: Rijksmuseum, 1955), p. 54, no. 37, pl. 17. Adhémar, Jean. French Drawing of the XVI Century. Edouard Mermod-Lausanne, trans. (New York: Vanguard, 1955), p. 111. Venturi, Lionello. Le XVIe siècle: De Léonard au Greco (Geneva: Droz, 1956), p. 248-49. Béguin, Sylvie. L'École de Fontainebleau, le Manierisme à la cour de France (Paris: Editions d'art Gonthier-Seghers, 1960), pp. 90, 92, ill.
Golson, Lucile M. "The Approach to Science of a Renaissance Painter: Research into the Theme and Background of the 'Astronomer's Studying an Eclipse' by Antoine Caron." Gazette des Beaux-Arts, 6th ser., 61 (April 1963), pp. 201-14, fig. 1. Reaves, Gibson, and Mary Kerr Reaves. "Antoine Caron's Painting 'Astronomers Studying an Eclipse.'" Publications of the Astronomical Society of the Pacific 77, no. 456 (June 1965), pp. 153-57, ill.
Grossmann, F. G. Between Renaissance and Baroque: European Art 1520-1600, exh. cat. (Manchester: City of Manchester Art Gallery, 1965), p. 24, no. 59. Béguin, Sylvie, André Chastel, et al., eds. L'Ecole de Fontainebleau, exh cat. (Paris: Editions des musées nationaux, 1972), pp. 32-33, no. 33, ill.
Venturi, Lionello. Renaissance Painting from Brueghel to El Greco. 2 vols. (New York: Skira and Rizzoli, 1979), vol. 2, p. 123. Ehrmann, Jean. Antoine Caron: Peintre des fêtes et des massacres (Paris: Flammarion, 1986), pp. 11, 111-12. "Acquisitions/1985." The J. Paul Getty Museum Journal 14 (1986), p. 218, no. 126. Massing, Jean Michel. "Review of Ehrmann (1986)." Burlington Magazine 129, no. 1015 (October 1987), p. 674. Jaffé, David. Summary Catalogue of European Paintings in the J. Paul Getty Museum (Los Angeles: J. Paul Getty Museum, 1997), p. 22, ill.
McGrath, Elisabeth. "Von den Erdbeeren zur Schule von Athen: Titel und Beschriftungen von Kunstwerken der Renaissance." Vorträge aus dem Warburg-Haus. 10 vols. (Berlin: Akademie Verlag, 1998), vol. 2, pp. 168-69. Blunt, Anthony. Art and Architecture in France 1500-1700. 5th ed. rev. by Richard Beresford (New Haven and London: Yale University Press, 1999), p. 100. McGowan, Margaret M. The Vision of Rome in Late Renaissance France (New Haven and London: Yale University Press, 2000), p. 155. Capodieci, Luisa. "Art et tradition hermétique à la cour de Catherine de Médicis (1547-1581)." Ph.D. diss. 3 vols. (Université de Paris I, 2005), vol. 1 pp. 371-91 passim; vol. 3, unpaginated, no. 136, ill.
Zuffi, Stefano. European Art of the Sixteenth Century. Antony Shugaar, trans. (Los Angeles: J. Paul Getty Museum, 2006), p. 273, ill.
Capodieci, Luisa. "Prodiges célestes et conversion dans un tableau d'Antoine Caron." In L'Art de la Renaissance entre science et maie, actes du colloque international, Université de Paris I [...] 20-22 juin 2002 (Rome: Académie de France, 2006), pp. 187-203, ill.
Battistini, Matilde. Astrology, Magic, and Alchemy in Art. Rosanna M. Giammanco Frongia, trans. (Los Angeles: J. Paul Getty Museum, 2007), p. 96, ill.
Smith, Bernard. The Formalesque: A Guide to Modern Art and Its History (Melbourne: Macmillan, 2007), p. 35, ill.
Vaquero, José M., and M. Vázquez. The Sun Recorded Through History (Dordrecht: Springer, 2009), pp. 185-86, ill.
Drahos, Alexis. L'astronomie dans l'art de la Renaissance à nos jours (Paris: Éditions Citadelles & Mazenod, 2014), pp. 43-45, fig. 43.